Intel offers another bit of hope in our ongoing quest for ultra-high resolution retina displays. The graphics capabilities of their upcoming Ivy Bridge processors will provide support for 4096x4096 pixel displays. Not only can the MFX engine display up to 4096 x 4096 pixels on a single monitor, but it can also handle video processing for 4K QuadHD video as well. 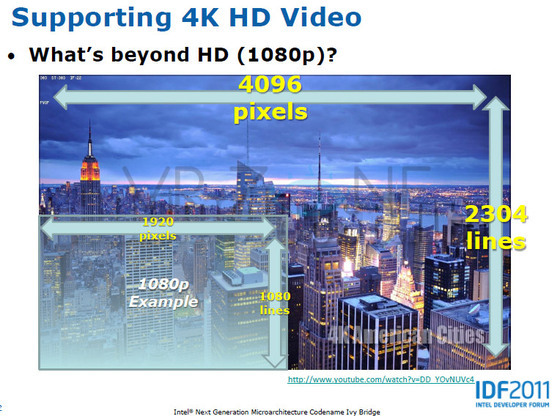 Remember when, two years ago, Jen Hsun Huang at Nvidia for the first time encouraged 4K resolution - at that time 3840x2400 or as he called it XHD2, for ultra realistic gaming too, to use the extra pixels to justify the high end card need? Now, what a fate, Intel is making it real on the - integrated graphics platform, of all. Now, can we have back those 16:10 3840x2400 or, better, 4096x2560 monitors? Ivy Bridge is Intel's next generation processor that also integrates a much improved graphics processing unit (GPU). Generally, high end computers aren't constrained by the capabilities of the integrated graphics processor. MacBook Pros and iMacs tend to integrate more powerful 3rd party GPUs. Slimmer models, however, such as the MacBook Air and Mac mini are dependent on the integrated graphics that Intel provides. So the 2012-era MacBook Airs should be able to support these ultra high resolutions that we've been dreaming about. OS X Lion has built in support for such displays and it seems Microsoft is also preparing for them. I think the title is supposed to read "...4096x2304 Screens"
I can't wait for these. Wondering how this will impact web development. 72 dpi images are standard - sounds like I'll have to code for 150 or 300 dpi images. Yikes on file size. As long as there's resolution independence then great! How much would a monitor with this resolution cost? Notice how 4k (4096x2304) is called QuadHD rather than DoubleHD. The picture nicely demonstrates how that comes to be. This is a small bit of vindication for those who have been correctly referring to "resolution doubling" as really being "resolution quadrupling" since screen resolution is not a linear measurement but a square one. 4 times the pixels, 4 times the screen real estate, 4 times the resolution, hence "Quad". Whatever we call it, it'll be sweet when it comes. Film and video production has been moving this way for a few years now. The RED ONE was the first semi affordable production camera to shoot 4k and RED now has a 5k camera. Sony, JVC and Canon all have or will soon have 4k cameras. This should really help the post-production availability and affordability aspects of production.